Managed Analytics improve the quality and sustainability of analytic results by enabling your team to centrally organise and access analytic content in a secure repository. The Managed Analytics solution enables audit to house their analytic content into a secure and centralised repository. The result is a library of audit content including analytic tests, source data, templates and results that enable a team to collaborate. Team members can easily and securely share content improving efficiency by allowing them build on the work of others, saving time and reducing duplication of work. The time required to access large data sets and conduct the required analysis is greatly reduced using server processing power. Analysis that would have taken hours or days to complete can be done in minutes. You can also access source data immediately, without complex time-consuming data extractions. By accessing data from the source, you increase the integrity and efficiency of your analysis and streamline audit processes. Moving to a centralised environment also ensures organisational data no longer needs to reside on laptops and personal computers, which can be lost or stolen. Access to specific data sets on the server can be restricted and controlled based on user profiles, ensuring only appropriate users gain access. A central audit repository greatly enhances the quality and integrity of analytic work. This allows the analytics used in previous analysis to be leveraged for future projects – ensuring more repeatable and sustainable use of audit analytics. The risk of previous analytic work being lost, due to the impact of staff turnover, is greatly reduced. The oldest and largest financial institution in the state, First Hawaiian Bank provides consumer banking services and trust, investment and insurance products through more than 58 branches. Based on previous success with ACL, First Hawaiian Bank implemented ACL Analytics Exchange and engaged ACL consulting services to identify and prioritise their next steps. The consultants helped the team map the data and created a structure to manage the implementation process. Several First Bank of Hawaii auditors also participated in ACL training programs, ranging from beginner-level data analysis instruction to advanced courses in fraud detection. This training has enhanced team efficiency and provided tools to help maximise their ACL investigations. 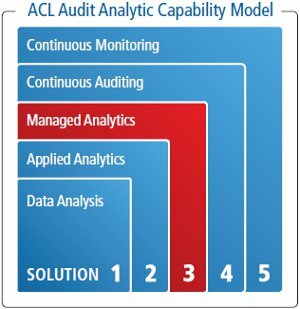 The audit team intends to use ACL Analytics Exchange for every audit project – from planning through to reporting. Approved analytics are housed in the secure audit repository, where auditors can simply click on a selected project to launch the analysis. The team has already stored several key analytic tests in the Analytics Exchange repository and will further exploit its capabilities as they work with other corporate business units. The repository enables the audit department to share and reuse data formats, audit tests and analysis logs without breaching critical security protocols or exposing confidential data.